In the fashion world, designers are always finding or designing the next big thing. Trends come well before the weather. It may be hot outside, but fashion and jewelry designers are already thinking fall fashion. This year, be ahead of the crowd. Discover the top 4 hottest fall jewelry runway trends. Asymmetric Earrings: Think about coordinating rather than matching. Have a drawer full of earrings that lost their mate? No problem. This fall you can pull them back out and wear them with confidence. 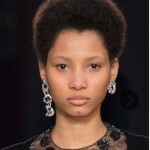 A big trend will be to wear different earrings of varying lengths at the same time. Raw Stones: Uncut or raw stones and crystals have once again made it to the runway. The natural look is always in style and this season is no different. Strings of Pearls: We all have a pearl necklace or two in our jewelry box. The latest trend is to wear them all at the same time – large, small, long, short, mix it up for a high fashion look. Layering: Have two or three necklaces that would look good with your outfit but can’t decde which one to wear? Wear them all! Once again, just like with the earrings, think about coordinating rather than matching. 1 Jazz up your earring game – mix and match your favorite designers. Pair a long, modern dangle earring on one ear with a traditional stud on the other. The trendy possibilities are endless. 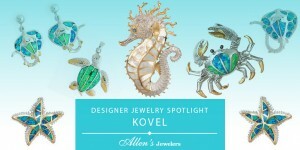 View Allen’s Collection of Designer Jewelry. 2. Add stones to your collection. Choose from our designers that specialize in colored gemstones including Yael and Michou. 3. Are you looking for your very first set of cultured pearls or something different to add to your collection to get the trendy look of the season? Allen’s Jewelers has a wide selection of pearls, from freshwater Cultured Pearls to more exotic Cultured Pearls like – Japanese Akoya, South Sea, and Black Tahitian. 4. A favorite among celebrities, Meira T. designer jewelry is the perfect designer to layer with your current pieces. Meira’s jewelry transitions well from day to night, allowing women to feel beautiful all day long. Come visit our Atlantic Boulevard showroom in Jacksonville and let our Team help you find the perfect jewelry design to fit your taste and style.